What’s good, yo. I’ve been busy with work and other endeavours, so doing this is going to take some getting used to again – but I am heading ever closer to retirement. In my quest to break away from the Friends theme that seems to be capturing my attention most of all, I’m taking on Series 1 of the new Mixels theme released this year. Mixels has already been covered several times over by far more popular personalities and web sites, but if you didn’t want my take on them you wouldn’t be reading this review! Purely on a whim, and because I’d have nine sets to review, I took a chance and bought all nine of the series a few weekends ago. I’ve heard that Mixels sets have been selling like hot cakes since, so I should probably consider myself lucky. Mixels is a joint venture between LEGO and Cartoon Network, and these sets accompany their very own cartoon on said channel. From the look of the character design on the packaging, I’d hazard a guess that the cartoon was designed around the set (i.e with prior knowledge of how they would look in LEGO parts). 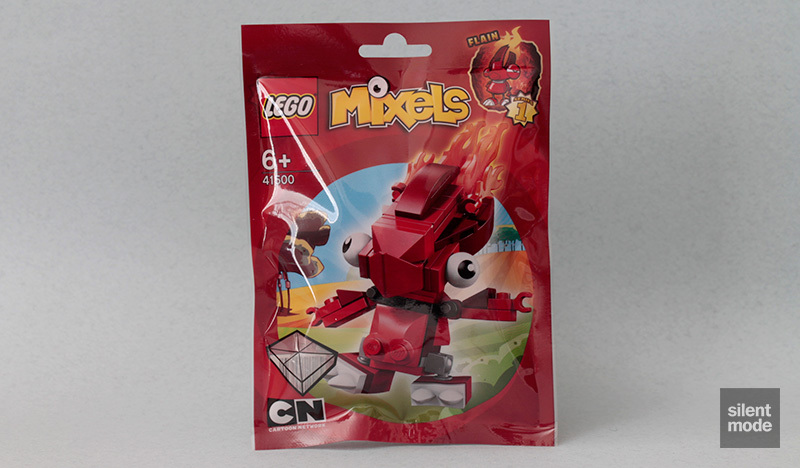 Featured prominently on the packaging is Flain, the first Mixels character we’re dealing with in set numerical order. One thing that became obvious, even before opening any of these sets, was that each of the set colours represented a different element. Maybe LEGO is going down the age-old Pokémon route with these things? In any case, red sets are obviously representative of the fire element. 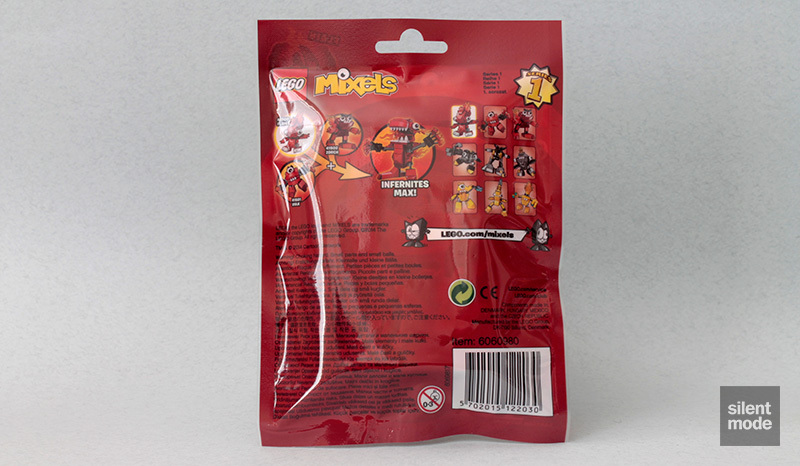 The back of the packaging gives us a sneak preview of the yellow and black sets that make up Series 1, as well as the fact that combining all the red sets lets you construct a devastatingly powerful, larger Mixel. Hence, the name of this theme! Hidden in the 742 lines of cautionary text at the bottom are numerous copyright and trademark notices… or at least, that’s what they look like. A bit like the Friends animals collectible series (whatever it’s called), the parts inside the tearproof packaging are neatly arranged inside a single plastic bag, along with crisp instructions. Perhaps this is a Friends equivalent for boys? There’s nothing that suggest that girls wouldn’t be keen on these too. Let’s start with a part that many an AFOL has been going nuts over for some reason: the ball-like parts with eye prints. Personally I’m not sure what all the fascination with this part is, and I’d be more excited over a 1×1 round tile with an eye print. However, these may come in useful for more realistic – or perhaps scary – MOCs further down the road. 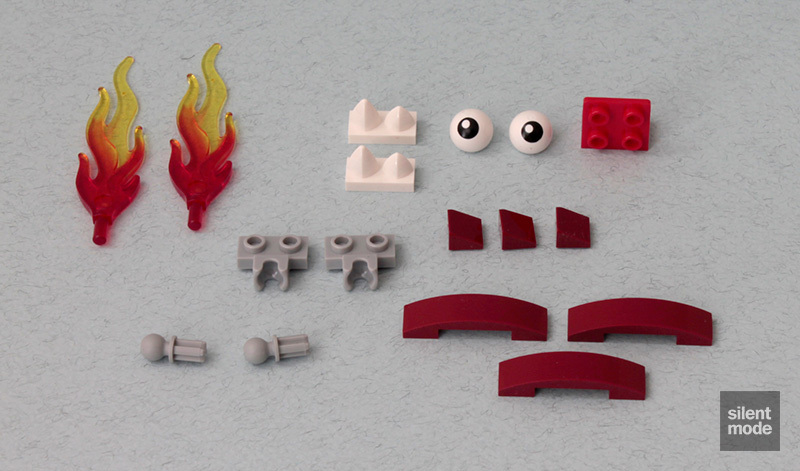 Four other Mixels sets have these eye parts. An odd new part is a vertical variant of the infamous “tooth” plate. 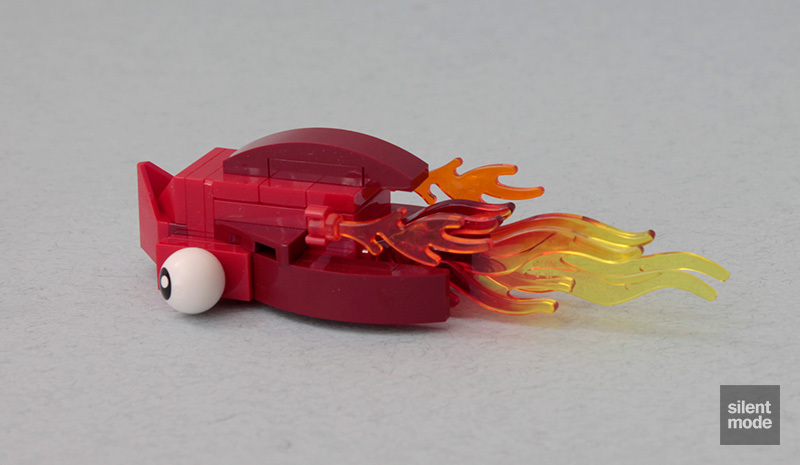 These kinds of parts are introduced by the Mixels theme, and this variant (with one tooth longer than the other) is currently exclusive to this set. The part I’m most excited about is the brand new joint parts in Medium Stone Grey, pictured in the centre. These are going to be invaluable for building mechs, armatures and other contraptions out of LEGO – and best of all they are rigid enough to keep in a single position. It’s a shame there are only two of these in the set, and I have a bad feeling – outside of ordering directly from LEGO they’re going to be fairly hard to get hold of in large enough numbers. In any case, all but one of the Mixels sets have this specific joint part in them. You’ll also find them in the Legends of Chima “Beast” sets, which seem to be larger versions of Mixels (except animal-based of course). You’ll immediately see how the new joint parts come into play, as the first couple of elements you’ll put together. I really like that the pins remain sturdy but aren’t too difficult to separate from the joint. Add a few more parts and you’ll form the body. You’ll find the arms are relegated to using good old hinge plates, so they can only flap up and down. Constructing the head feels a lot like building a squid, particularly when the eyes and Dark Red bow parts are added. Introducing Flain, a bird-like fire type Mixel: known for being a feisty, fiery fighter that loves getting into scuffles. Ignite your imagination with Flain! Flain is the adventurous leader and known as “the smart one”. But beware, if Flain thinks too hard that massive brain of his will soon catch fire! The general idea is that you can collect, mix and match these Mixels characters to create new ones – kinda like customising your own Pokémon. The only part left in this set is a single, tiny cheese slope in Dark Red. What a rip! 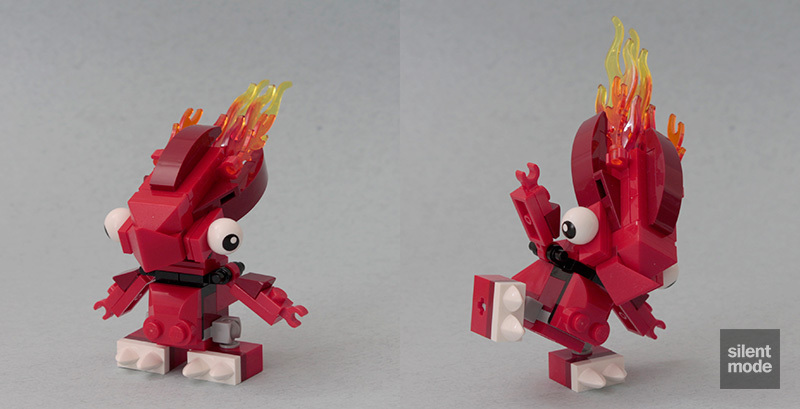 Having looked at all the fire type Mixels, this one is the most interesting – I think the giant flames shooting out of its head sells it. The biggest let-down is the lack of articulation in the arms, compared to the legs, but at this size it’s understandable. What’s really surprising is how “solid” and sturdy the character is, given the number of parts and how they’re used. On its own merit I’m giving this set 6.8/10 – if you can stand the colour red, it may be worth picking this up.